BAD in an all-new scale revealed today at Galaxy’s Edge! 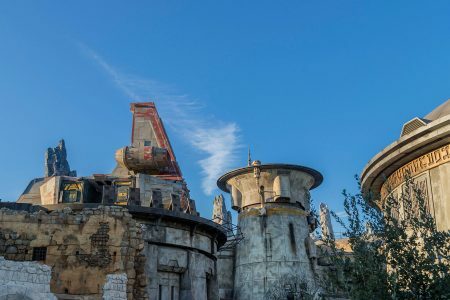 Click below for a look at our full gallery of Galaxy’s Edge reveals from this morning! See our Instagram and Facebook pages for more! ← The Black Series [Phase III] Electronic Shock Trooper Helmet 50% Off! 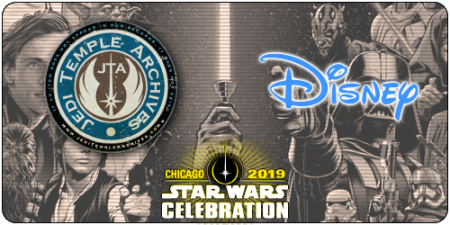 Head to our Facebook gallery for an exciting look at some great 3.75″ Droid Depot color changing droids coming to Galaxy’s Edge INCLUDING a blue Lars’ Power Droid! See our Instagram and Facebook pages for more! ← LEGO Darth Vader Bust At TARGET Online! We took a walkthrough of the Galaxy’s Edge booth to check out a taste of what’s to come at the park. Click through for our full gallery! A lot of news surrounding Disneyland’s Galaxy’s Edge attraction has surfaced in the last couple days. Earlier we posted about the upcoming merchandise you may find in the streets of Batuu, but there is so much more to the land than just what you can buy. TechCrunch was able to interview Disney Portfolio Executive at Walt Disney Imagineering, Scott Trowbridge, and he provides us with some amazing insight into the world of Galaxy’s Edge. If you were wondering what their thought process was behind creating a new planet, you’ll want to read more. ← Former TRU Exclusive C-3PO/R2-D2 Two-Packs Set On Amazon! 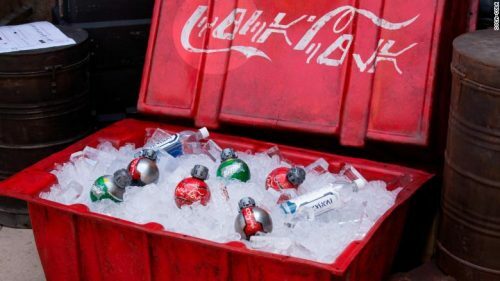 It was announced a while ago that visitors of Disney’s all new Galaxy’s Edge Star Wars attraction would be able to buy “in-universe” merchandise. Now an article on attractionsmagazine.com gives us a first look at this merchandise. You’ll be able to buy clothing (Jedi robes, as well as First Order and Resistance outfits), custom made lightsabers, Holocrons, Jedi and Sith artifacts, plush creatures or “artisan style” plush toys of various famous Star Wars characters plus a few other things such as musical instruments. Of special interest to JTA readers will probably be that you can also buy your own custom made BB or R-unit droid (which sounds like Disney’s build-a-droid). What seems to be missing, at least it was not mentioned or shown in the article, are Imperial outfits or more old-fashioned Rebels outfits. 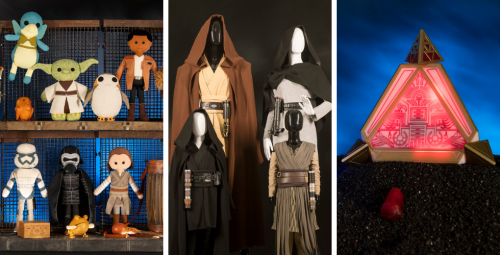 While the various toys and artifacts seem to span all movies and eras, most of the clothing you can buy (other than the Jedi robes) appears to be focused on the new entertainment. Check out more photos of the merchandise over on attractionsmagazine.com! UPDATE: Please check out the new Galaxy’s Edge article on io9 for all the details you will ever need to know! Basically all the questions you still have will be answered! Including what the droids you can build will be: they will be fully radio controlled, so probably at least the size of a Sphero. And the droid, when you control it through Batuu, will even interact with various things you will encounter along the way. A Disney spokesperson also explains why Batuu (and not some established planet) was chosen and how Galaxy’s Edge can change with any new movies and shows. JTA reader Mark G. alerts us to an important detail featured in an article by Baron’s featuring information on what everyone needs to know about the Galaxy’s Edge theme park coming to Disney. In it, it strongly hints at the possibility we could see exclusive action figures. Check the article out for yourself! Wow! These are pretty fantastic. Shop Disney is selling a miniature Sandcrawler? It comes with small Droid Factory figures. JTA reader Patrice P. from France just purchased two and inside were R2-B1 and R4-M9 respectively. You can order yours HERE for only $4.95 each! Click through for more!. Cyber Monday is happening now at Shop Disney! Save as noted below with promo code CYBER! Shop Disney has much of their online merch on discount for Black Friday. And, get an extra 20% off your entire order at checkout when you use code AMAZING. Free shipping kicks in over $75 with code SHIPMAGIC. Toy Box figures are on sale for $10, but knocked down to $8 each after the discount code. Click here for their Black Friday sale page. Two attractions at Galaxy’s Edge have been revealed thanks to YouTube. Both Star Wars: Rise of the Resistance and Millennium Falcon: Smuggler’s Run can be seen. You can now order the Sandcrawler Playset at Shop Disney. Special thanks to JTA reader Craig F. for the alert! Limit 10 per order! DisneyStore.com has this year’s Droid Factory Holiday droid available to order. Click here to order R4-H18! Thanks to our friends at The Astromech Collection for the alert! Shop Disney Parks App Has Sandcrawler Playset Again! ← TBS6 [P3] 4-LOM IN STOCK At Amazon! New Elite Series droids are coming to Shop Disney shortly. They’re currently available on the French version of the site. Special thanks to JTA reader Darth Rizzen for the alert! ← Disney Droid Factory Sandcrawler Playset: Watch The Live-Action Video! JTA reader Smith John posts an image of the old Hasbro Sandcrawler on top of the new Disney Droid Factory Sandcrawler in our comments. See the size difference for yourself! Disney Droid Factory Sandcrawler Playset: Watch The Live-Action Video! Do you want to see the Disney Droid Factory Sandcrawler in motion? Do you want to hear it’s sound effects and see how how it lights up? JTA reader and friend Logan has taken video for us and we put it up on our YouTube channel for your viewing pleasure! Check it out! Disney Droid Factory Sandcrawler Playset: See The Interior, Lights, & Features! Alright, here we go, folks! With EXTRA SPECIAL thanks to friend and JTA reader Logan, we’re able to provide you an exclusive look at the interior and exterior of the Disney Droid Factory Sandcrawler Playset. This thing is beyond impressive. It comes loaded with lights and sounds (video forthcoming) and has INCREDIBLE sculpting within its four walls that has completely blown us away. The detail is overwhelming and has plenty of room for a hoard of droids. This is going to be a hot item for 3.75″ collectors. Disney went above and beyond here. We should count ourselves very, very lucky! By the way, measurements are 20″ long, 9.75″ wide in the front and 9″ wide in the back. UPDATE: The Sandcrawler’s full features include: retractable claw, opening light-up cockpit, motion activated sound, lights, sound effects, trap door, motorized elevator, light-up furnace. ← Disney Droid Factory Sandcrawler: Loose Pack-In Jawa Images! Disney Droid Factory Sandcrawler: Loose Pack-In "GONK" Droid Images! And here are some awesome new loose images of the pack-in “GONK” Droid, which looks to be based off of The Vintage Collection Special Action Figure Set figure by Hasbro. We will never see the vintage Kenner blue one ever in 3.75″ scale updated? Disney Droid Factory Sandcrawler: Loose Pack-In Jawa Images! Here are some awesome new loose images of the pack-in Jawa to the Disney Droid Factory Sandcrawler Playset. The figure comes with ball-jointed shoulders, but the rest of the figure is pretty static. Still, it has a pretty decent sculpt. ← BREAKING NEWS! Disney Droid Factory Sandcrawler Revealed! BREAKING NEWS! We now have a closer look at the pack-in figures to the Sandcrawler Playset. Both figures look minimally articulated, but I wonder if that GONK Droid is the first Build A Droid figure of this particular droid type. Imagine a future Droid Factory Lars’ Homestead GONK Droid because you know Hasbro is never going to give it to us. BREAKING NEWS! Disney Droid Factory Sandcrawler Revealed! BREAKING NEWS! We’re thrilled to present you with the very first image of the Disney Droid Factory Sandcrawler Playset (3.75″ scaled), complete with “GONK” Droid and Jawa figures. This vehicle/playset was announced at Star Wars Celebration Orlando in April 2017 – but it was only teased. Thit item will retail for only $99.99 and comes with lights and sounds. Also, it is about 75%-125% larger than the old Hasbro models. And look at that deco. It’s amazing. We are trying to secure additional images as we speak, so be sure to stay tuned. This is one of the most exciting releases in a VERY long time! Let us know about your anticipation of this wonderful item in the comments! ← Shop Disney Has Chewbacca Star Wars Toybox Figure! Shop Disney Has Han Solo Star Wars Toybox Figure! The Han Solo Star Wars Toybox figure is also in stock at Shop Disney if you’re interested! Shop Disney Has Chewbacca Star Wars Toybox Figure! The Chewbacca Star Wars Toybox figure is in stock at Shop Disney if you’re interested! What's The Deal With Audience Reaction Disparity For Star Wars: Resistance? Folded up inside of the latest Disney Toybox figures is a pamphlet showing off new vehicles! This line is killing it! They were so smart to focus on OT characters and vehicles after the first wave of Sequel Trilogy themed characters. Special thanks to JTA reader Matthew C. for the image and alert!